If you have osteoporosis, make it a priority to prevent broken bones. Even if your doctor suggests medicine, there are plenty of things you can do on your own to avoid accidents and keep your bones strong. Some simple tweaks to the way you live can make a huge difference. Many people with osteoporosis worry about the risks of exercise. After all, if you're jogging on a treadmill or out hiking, aren't you more likely to fall? What could better protect you from a broken bone than sitting in a comfy armchair all day? The truth is, though, that exercising cuts your chance of falling. It keeps your reflexes sharp and your muscles strong, which helps with coordination and makes it less likely you'll take a tumble. Exercise will improve your balance, too. A fitness routine also has a direct impact on the strength of your bones. Bone is a living tissue. Like muscle, it weakens if you don't exercise it. By staying fit, you can make your bones stronger and less likely to break during a fall. Experts generally recommend a combination of weight-bearing exercise (like walking), resistance exercise (like lifting weights), and flexibility and balance exercises (like yoga or tai chi). Talk to your doctor before you start to work out. High-impact exercise, like jogging or tennis, may not be safe for some people with osteoporosis, since the physical pounding could cause a fracture. Consider more than fashion when you choose your shoes. The wrong sort of footwear can raise your chance of having a fall. Look for low-heeled shoes that offer good support and have rubber soles rather than leather ones. While sneakers are fine, avoid ones with deep treads that can trip you up. Also, it's a good idea to wear shoes inside the house, too. You raise your chances of slipping when you walk around in socks and slippers. When you're outside, play it safe. Walk on the grass when it's been raining or snowing, since you're more likely to slip on concrete. Always put salt or kitty litter on icy patches around your home. 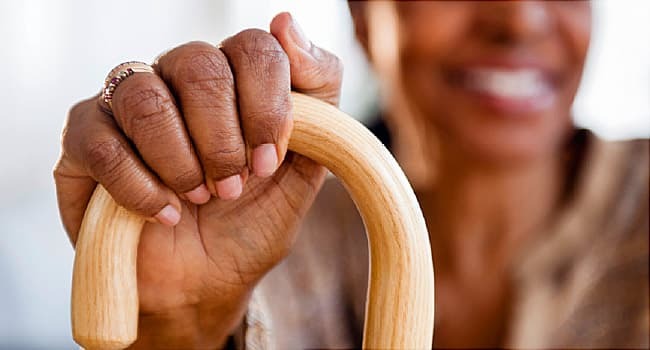 If you have trouble walking because of a medical condition, like arthritis, make sure to use the assistive device recommended by your doctor or physical therapist, such as a cane or walker. Other drugs, like some corticosteroids, are linked with a higher risk of osteoporosis and fractures. Don't stop taking any medications without talking to your doctor. It's possible that he can change your dosage or switch medicines so that you're less likely to take a fall. Install overhead lights in all rooms, so you don't have to stumble around in the dark to find the lamp. Use nightlights in your bedroom, bathroom, and any hallways that connect them. Make sure all stairways, both inside and outside, are well-lit. Put carpet or plastic runners on polished floors. Get throw rugs, electric cords, and phone lines off the floor. Put handrails on all stairs. Install railings in the bathroom around the toilet and the shower. Put a rubber mat on the floor of your bath or shower. Some long-term medical problems can affect your strength and raise the chances of a fall. For example, arthritis can make it hard to move around, and vision problems can make it more likely you'll trip. If you have any health conditions, ask your doctor if they might raise your risk of a fall. If they do, see if any treatments might help. Get regular checkups with your primary care doctor, eye doctor, and any other specialists you need. Even with precautions, some types of bone fractures are tough to avoid. Just a mild bump can be enough to break a bone in people with severe osteoporosis. In some cases, something as simple as bending over or even coughing can also cause a fracture. Even though some fractures can't be prevented, you need to work on the fracture risks you can control. While bone breaks may be more likely as you get older, they aren't inevitable. Sure, some of these fracture prevention tips require a little effort and planning on your part. But are they worth it? You bet. A little preparation now can keep you injury-free. Shreyasee Amin, MD, rheumatologist, assistant professor of medicine, Mayo Clinic, Rochester, MN. Fiechtner JJ, Postgraduate Medicine, September 2003; vol 114. National Institutes of Health: "Osteoporosis Overview." National Institutes of Health website: "Osteoporosis." John Schousboe, MD, consultant rheumatologist and director, Park Nicollet Clinic Osteoporosis Center, St. Louis Park, MN; fellow, American College of Rheumatology.